Dyes used to be an alchemy only crafting item, but its now open to all players that wants to look even more unique than the rest of the players. Dye vendor can be found in any major city, and they sell you already bottled colour dyes on a single use and they also sell you a choice of 7 dye kits to allow you to create a particular colour dye in bundles of 3. Vendor Dyes are temporary with a maximum duration of 7days. 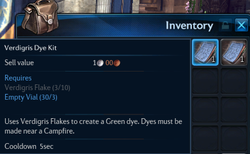 Right clicking the kit will bring up Dye crafting window, you select what piece of armor you want to dye, then you can set your colour tones, that depend on the kit you currently using, it also allow you to preview the changes. When all is set to match your taste, just press apply, a new confirmation window will pop up. 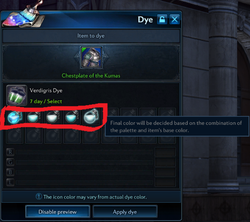 Near the remodeling merchant is the dye vendor, which sells two types of dyes – 1 day lasting dye that costs ? gold each and 7 day lasting dyes that cost ?each and comes with a bit more color variations.